Antioxidants are “free radical scavengers”, and prevent and repair damage done by free radicals. Therefore, consuming foods high in antioxidants is great for your health. Antioxidants are found in many foods, with some of the top sources being fruits, vegetables, nuts, seeds, spices, whole grains, and some meats, poultry and fish. The antioxidant capacities of food is measured using the ORAC (oxygen radical absorbance capacity) scale, of which berries score very high. Hence, the name of this smoothie recipe. I like to get bags of frozen mixed berries, which you can find at your local health food or grocery store. Go organic whenever possible. Now to fighting those free radicals with some antioxidant power. Enjoy! Add the ingredients into your blender and blend on high for 30-45 seconds or until your desired consistency is reached. As always, comments about this smoothie are both welcomed and encouraged. Happy blending! Hi,mmm this antioxidant berry blast smoothie looks really good and someday I will try it and make it in my blender.but I was wondering about the sea salt.I have high blood pressure which I am on meds to keep it under control it,so I was wondering is it safe and OK to use sea salt in this smoothie.how much sea salt should I put in this smoothie? Just a dash of sea salt is called for, Kim. I can’t say whether it’s OK for you to use, a medical professional can though. Hi,thank you for replying to my question about the sea salt and I will buy some sea salt to put a dash of it in my smoothies . 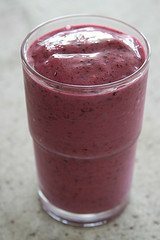 Hi,I was wondering if it will be OK and fine to use Saskatoon berries in your fruit smoothies with the other healthy smoothie ingredients? Sure you can use Saskatoon berries, Kim. Let me know how they taste in a smoothie.